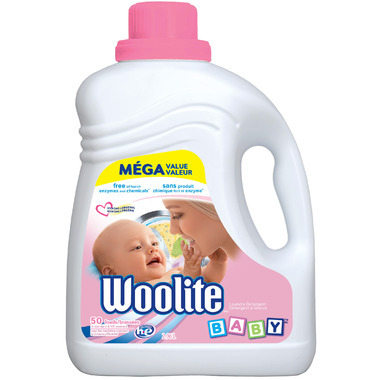 Woolite Baby Laundry Detergent is specially made to clean baby clothes. This detergent is delicate enough for baby's sensitive skin. Woolite baby is hypoallergenic and is free of harsh enzymes and chemicals. Have used this product for almost 3 years and both my children have very sensitive skin and no problems with this detergent and still tough enough to get out spit up and potty training stains. Been using this for the past 19 months for the kid's clothes and cloth diapers. Good price and seems to work well while being gentle on the diapers. I'm using this for my own adult sensitive skin. I prefer it to the Ivory baby soap. Still, I need something more since I see react sometimes to this, but that's me, not the product. Great product - soft clothes and smells wonderful! really useful and effective for the sensitive baby skin.